It’s safe to say that S.N.L.’s political commentary on the upcoming election hasn’t been entirely kind to Donald Trump supporters. The biggest example of this has to be when they created a fake ad where it practically compared them white nationalists or even Nazis. So when we saw them taking yet another satirical swipe at the billionaire businessman’s unwavering supporters, with the help of Tom Hanks playing the role of conspiracy theorist and Trump fan ‘Doug’, we were expecting his character to be just as racist as the candidate he supports. 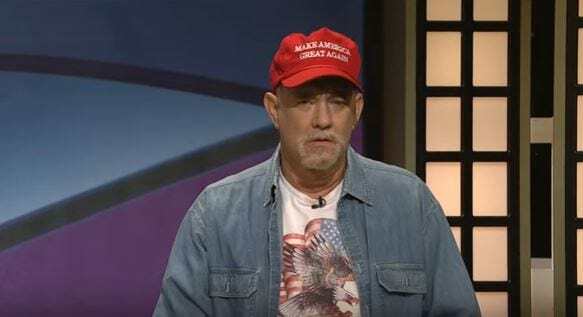 However, this sketch took a somewhat unexpected turn as Hanks was playing as a paranoid contestant on spoof game show ‘Black Jeopardy’, revealing that there may not be such a huge difference between Trump’s base and the black community represented. The chemistry between the host and contestants grows as Doug manages to nail questions on the upcoming election and conspiracy theories, of course. But unfortunately for Doug his time on the show comes to an abrupt end as the final category introduced is ‘Lives That Matter’. “It was good while it lasted, Doug,” the host jokes. When you’re witnessing an absolute car crash of an election such as this, I guess you have to laugh at it or you’ll just cry otherwise.